One of the key challenges in cancer research is to find patients that will respond well to targeted drug therapy. Specific mutations in a patient’s tumor can be an indication of the patient’s potential responsiveness to such therapy. Recently we added support for custom mutation annotations to the OncoPrint view in cBioPortal. This allows users to visualize mutations with their own custom annotations such as ‘driver’, ‘highly actionable’ or ‘potential drug target’. This feature was requested by AstraZeneca and we have worked with the community to include it in a way that serves as many users in the best way possible. 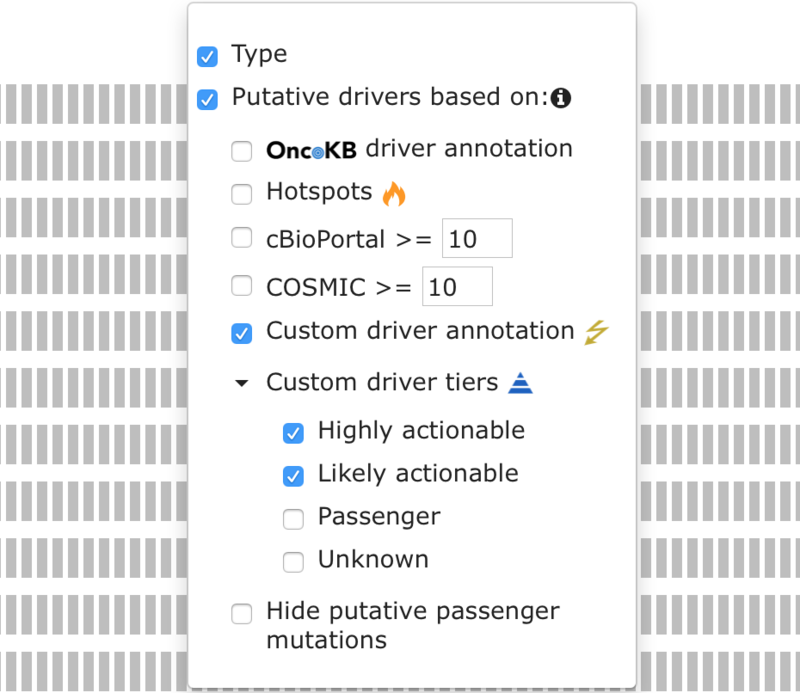 cBioPortal annotates mutations as either driver or passenger using information from external databases such as OncoKB and Cancer Hotspots. Drivers are aberrations that give a selective advantage to tumor cells and thereby promote tumor growth. Passengers lack this ability and are merely regarded as side effects. The OncoPrint view can be used to find the patients that have these driver mutations. In this project we added functionality for two types of custom annotations to cBioPortal. One describes whether a mutation is either a driver or passenger, while the second is a tiered system which can be used to indicate levels of actionability. This allows a user to use his own scoring algorithm to define these levels, such as “Highly actionable drug target”, “Potentially actionable” and “Unknown actionability”. These annotations can be added to the mutation data file that is loaded into cBioPortal, which is in an extended MAF format. study which contains these data, the OncoPrint view will display an option to use these custom annotations. To learn more about this feature and how to add these annotations yourself, take a look at the documentation we wrote. This feature is included in the public release of cBioPortal (GitHub) since version 1.9.0. If you need any support, please contact us. This work has been sponsored by AstraZeneca UK and released to the OpenSource community of cBioPortal.